An admission packet is the minimum number of cards or paper packs that a player needs to purchase to take part in the bingo game. Six to twelve cards usually comprise the admission packet for every regular, and sometimes, unique game. The content and price of an admission packet vary across different bingo halls. Enables the game operator to determine how many sheets each seller has been allotted and how many sheets have been sold. A simple version of a Pull tab. 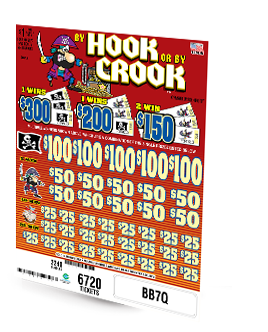 If an instant, simply pay prize won by matching the symbols on the front of the ticket with the play symbols under the perforated pull tabs, inside the ticket. If a seal, it is a simple seal card game paying the seal prizes under the perforated windows on the seal card. Bingo is a specific game of chance in which participants use cards, paper sheets, or card minding device representations, divided into horizontal and vertical spaces, each of which is designated by a letter and a number. The letters and numbers on the card conform to a predetermined and preannounced configuration of the letters and numbers selected at random award prizes. Originally made of wood, bingo balls are now made of plastic and are similar to ping pong balls. They come in sets of 75 or 90 and are mixed in a console or blower chamber in order for the caller to select balls, randomly. A wood or metal cabinet, consisting of a blower chamber and a master board, used to operate a bingo game. It is a device with a receptacle, or hopper, for the unselected bingo balls, a blower for selecting the balls, and a ball tray that contains seventy-five, or ninety holes in which the bingo ball is placed, once it is called. Bingo consoles are also known as desks. An event game is a type of pull tab game, with or without a seal card, that is designed by the manufacturer so that certain prizes are determined by the draw of a bingo ball. Often played in conjunction with a regular bingo game. A bingo paper pack or booklet is a group of specifically numbered bingo paper sheets typically of different colors that is manufactured and collated each sheet, containing the same number of faces (ON's) to be played for each game at a bingo session. The packs or booklets are collated in the order in which they are played. A forced-air device that mixes the bingo balls and dispenses them to the caller who then announces the number and displays it on a bingo board. Bonanza bingo is a progressive coverall jackpot that is usually played as the 13th game of the session. Forty-five numbers are drawn before the session and players mark them on separate cards and set aside. There is an additional fee to play this game, usually $1. The countdown for a bonanza game begins at 48 numbers or less and goes up one number per week to 52 numbers or until won. The number of card sales for that game determines the amount of the jackpot. Two (2) or more sheets glued together. Can be either straight goods or collations. A multi-ply card, made completely from paper or paper products, with perforated break-open tabs. These perforated tabs cover a series of numbers or symbols that determine whether a particular ticket is a winner or non-winner. A break open is another name for a pull tab, instant bingo ticket, tear-offs, pickles, cherries, lucky 7's, peel-offs, bell jars, Nevadas or club tickets. The price charged for a "Packet" of bingo paper for an event's play. Different buy-in levels are offered based on the player's ability to play (and pay). Buy-in levels consist of different packets of early birds, regular session, specials and night owls. The person who randomly "calls" balls in the play of bingo. He or she usually sits above the crowd so that everyone can see him or her. A card containing 24 numbered spaces and one free space (blank, or it will have a number or the words: "free space"), with which you play BINGO. The numbers are assigned at random on each card and are arranged in five columns of five numbers each by five rows (5 x 5 = 25 total including the free space). The numbers in the "B" column are between 1 and 15, in the "I" column between 16 and 30, in the "N" column (containing four numbers and the free space) between 31 and 45, in the "G" column between 46 and 60, and in the "O" column between 61 and 75. Players have thousands of unique (unduplicated) cards from which to choose. The majority of bingo cards used today are disposable and printed on newsprint type paper. Hard cards are available but are not commonly used today. A card minding device means any mechanical, electronic, electro-mechanical, or computerized device that is interfaced with or connected to equipment used to conduct a game of bingo and that allows a player to store, display, and mark a bingo card face. A game style in which unclaimed prize money from one box of a game is carried over to the next game. A deal of tickets with instant winners & possibly one or more additional elements of play. One additional element is a U-Pick ticket. Players redeeming U-Pick tickets can either choose a window themselves (also called a Player's Pick), or are directed to a specific window (the window is numbered on the purchased ticket) on the oversized flare/seal. Behind each window is a monetary amount that the player wins. The second possible element of play is a seal. A certain amount of players will receive a 'HOLD' ticket. These players will sign up on the oversized flare/seal for a prize determined after all tickets are sold. The monetary prize is under a seal, which typically gives 3 potential ways to win; the operator will choose 1 of the 3 options for one or more winners. Several small count separate serial numbered games are tied to an oversized seal card. Each deal has an individual seal card that displays the instants and holders. The hold winner is determined once all tickets are sold and instant winners have been paid. The hold winner from each small count game chooses a window on the oversized seal card to reveal a prize. Each deal contributes an equal amount toward the prize pool on the oversized seal card. The oversized seal card contains prizes both above and below the amount contributed by each deal. This allows pooling on the prize money from several deals to allow prizes larger than a single deal could provide. Any religious, benevolent, educational, fraternal, veteran, service, non-profit medical, volunteer rescue, volunteer fire, senior citizen or youth athletic organization that is exempt from the payment of federal income tax under section 501(a) and listed in section 501c3, c4, c8, c10 or c19 of the Internal Revenue Code. Small round plastic discs used in the “old days” to cover called numbers on hard cards. As their use became "modernized”, plastic magnetic “wands” were developed to “clean” the card, once play ceased. A coin board/merchandise board is a game board that contains coins or merchandise as prizes and is played in conjunction with instant bingo or pull tab tickets. In addition to instant cash winners, certain pull tab tickets designate a winner on the coin or merchandise board. The prize associated with that number is awarded to the ticket holder. A coinboard and coinboard game consist of a main board/seal card with coins or merchandise as prizes. Instead of winning only cash, a coin or merchandise board may award a rare coin or merchandise such as a leather jacket. The game will contain tickets that qualify the holder to pick a window or predetermined prize from the main board. A graphic that is printed and place over a Coinboard template. Coinboards may actually have the coins imbedded in the board within holes cut out to accommodate the coins. The overlay lets the distributor change the prize values and the names of the games by simply changing the board graphics. Some coinboard tickets are generic and this is an easy way to offer variety. 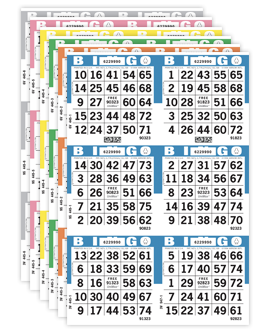 A tablet or pad of bingo sheets arranged in a specific color sequence providing game operators an easy method of differentiating cards for a selected group of games. Each game of the session can have its color sheet. Collations can be obtained in either a standard rotation or a custom own rotation. The numbers printed overtop of the "N" in the word BINGO on each bingo face to identify that particular set. They are used to keep unauthorized paper out of a game. UniMax ® bingo paper has a single unique serial number for each set of paper. Indicates the direction that a sheet of faces will be cut from the master sheet. A cut can be square, horizontal or vertical. For instance, a 3 ON Vertical cut is three faces arranged one over the other in a "top-to-bottom" format. A 3 ON Horizontal cut is three faces arranged in a "side-by-side" format. 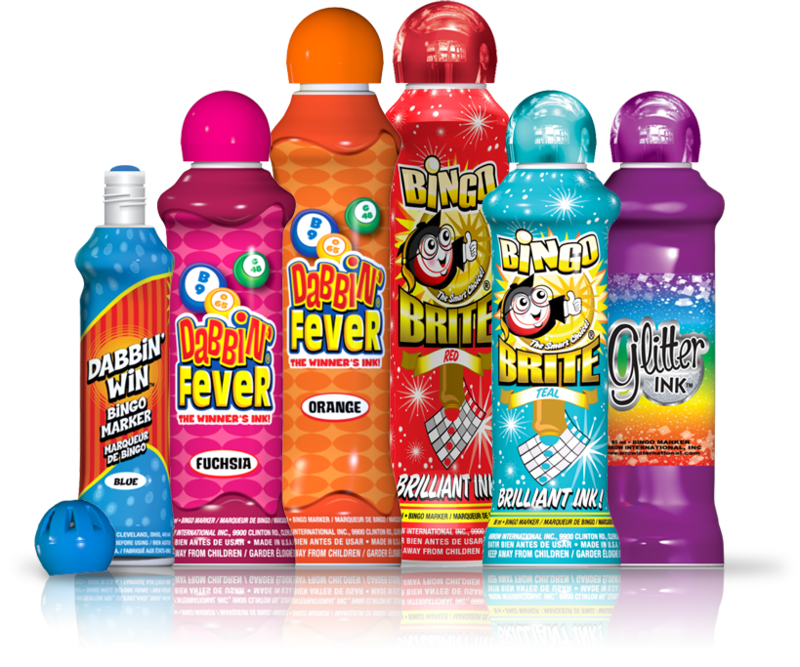 A bingo dauber is an ink-filled bottle/pen with a foam tip on it used to mark called numbers. When you touch the bingo card with the foam tip, it marks the square. Other names for daubers are dabbers or ink markers. The small boxes inside a case of pull tabs. The case may be packed in 2 deals or more per case depending upon the number of tickets in the deal. A deal is each separate game or series of pull tabs that have the same serial number. Diecuts can create uniquely shaped tickets (e.g. snowman, football, key, etc.). A short bingo session (2-8 games) placed before the regular session, used by the bingo operator to get players to the hall well in advance of the start of play. Small prizes are usually awarded. The individual bingo sheet containing 24 numbers plus the consecutively numbered center free space in the middle. The flare card is a card or poster included with each deal of instant bingo or pull tab tickets. A flare card will include the name of the game, the form number, the serial number of the game, and the cost per ticket or play. The flare also explains how a game plays and what the winning symbol combinations and associated prizes are. The person who keeps the bingo hall operations moving smoothly throughout the game; he/she usually work a section of the floor selling pull tabs and can also be called upon to step in to call back or verify a winning bingo. The center square of the card, which does not have a number assigned to it. It's like a Joker or a Wild square. You get it free every game, and it counts towards your winning pattern. Allows you to verify the winning face in a bingo verification checkbook or with our electronic Verifier System. This number will run consecutively through the series; a 1-9,000 series will have free space numbers from 1 to 9,000. Refers to a combination of squares that are required to be covered to win a bingo game. For example, the letter "X" game pattern tells players that they must cover both diagonal rows to win. A hard card is a reusable card bearing a bingo face or faces usually played using plastic chips. A hard-way bingo is a bingo pattern in a straight line without the use of the free space. A game of chance similar to a pull tab except that an instant game does not utilize a seal card. There are no holders; all winners are paid out instantly. A big prize usually awarded for achieving a difficult pattern (such as a blackout), within a specified number of balls called. A carnival or gaming ticket printed on lightweight paper, folded and held by a strip of colored tape, containing numerals or symbols. They are usually sold in see-through acrylic bins. A short bingo session (2-8 games) placed after the regular session. Small prizes are usually awarded. Jar Ticket product that is not pasted (or possibly stapled) together in bundles. Bingo paper not collated into books or pads and sold individually. Loose paper is typically used for "specials." The Lucky Jar or Cookie Jar is a container with cash. You win the contents of the Lucky Jar if you bingo on the lucky number. The lucky number is usually the first number called at the beginning of a session. Money is added to the jar every time the lucky number is called or if the caller makes a mistake in announcing the game. Usually, you can win the lucky jar only on regular games. There is no lucky number in play on special throwaway games. Indicates that every section of the set carries an identical serial number. The least amount you must spend to be eligible to participate in the game. A number is drawn before the game that will double a player's winnings if bingo is hit on that number. A session of bingo that starts late at night, usually about 10:00 pm. Multiple winners are when two or more players bingo at the same time. When this happens, the cash prize is divided between/among them. For example, if there are five winners on a $500 game, they each receive $100. The National Association Of Fundraising Ticket Manufacturers (NAFTM) mandates that U.S. pull tab manufacturers place a seal on each deal of pull tabs. This means that the pull tab has been approved by the association. If the seal is broken, the box could be tampered with, and it should not be sold. This is a way of announcing or repeating the Bingo number drawn humorously. In a crowded, noisy room it also helps to confirm the number called. Bingo play using nicknames persisted in British Bingo halls until faster computer draws replaced air-blown balls. Examples of 2 popular U.S. bingo nicknames are: 77 – Sunset strip, 29 – You’re doing fine and in your prime. Bingo session of 2-8 games. Hall operators use this to allow the players to stay after the regular bingo session. Small prizes are awarded. Refers to faces that cannot be cut from the master sheet in the desired ON. For instance, if the master sheet is a 24 ON Vertical and you order a 9 ON sheet, the result will be two (2) 9 ON cuts equaling 18 faces and an OFF CUT totaling six (6) faces to complete the 24 faces on the sheet. Refers to the number of bingo faces per sheet. Example: A 9 ON would have nine faces per sheet. Consist of a number of bingo paper "ups" or pages, used by the operator to bring players into the bingo hall. Known as a "package deal" for the player. Some bingo paper is ordered in "padded" form, usually in books of 25. The padded paper is used because it provides more control for sellers/floor workers than loose paper. Sold in 1 color - full series. The shape you need to cover on your card with called-out numbers. You only need the numbers that form the pattern to win the game. The most basic patterns are straight lines in a horizontal, vertical or diagonal direction. One popular pattern is the "blackout" or "coverall," where you have to cover the whole card to win. The percentage of sales paid out by the House. This compares with a payout of approximately 45 percent on state lottery games. A stand-alone bingo game and the operator sells for that particular game only (not part of the packet). The proceeds from the sale are split between the winner and the house 50-50 or 60-40. A small one-window pull tab. Also known as a stamp or tabbie. A progressive game is a seal card game with a designated jackpot that, if not won, is carried forward and added to the jackpot of the subsequent deals of the game until the jackpot is won. A pull tab/popp-open is a game of chance using a folded or banded paper ticket, or a paper card with perforated break-open tabs, the face of which is covered or otherwise hidden from view to conceal a number, letter, symbol or set of numbers, letters or symbols, some of which have been designated in advance as prize winners and shall include tickets that utilize a seal card. Pull tabs are commonly known as tickets, break opens, popp-opens or charity game tickets. A bingo face printed on heavy paper stock with die-cuts, allowing the numbers to be folded when called. Pushouts can be reused. (Also known as a Lightning or Speed game.) A very fast paced game usually played early in the session on single cards. Small prizes are usually awarded. A raffle is a game of chance in which a participant is required to purchase a ticket for a chance to win a prize, with the winner to be determined by a random drawing. Just as the name indicates, the regular session is the main attraction consisting of anywhere between 10 and 20 games and usually has the big jackpot as the last game to "hold" the crowd. A heavy paper card used in the play of pull tabs, jar tickets, tip boards and coinboards. A seal card is a board or placard used in conjunction with charity game tickets, that contains a seal or seals which, when removed or opened, reveal predesignated winning numbers, letters, or symbols. These pull tab games include instant winners, but further the chance to win through utilizing "holders." Holders are generally red 00's or 13's. Once the box of tickets is completely sold, the game operator opens the seals(s). The person(s) holding the numbers that appear(s) under the seal will win the indicated price. The number printed on the "N" of each bingo face to identify that particular set. They are used to keep unauthorized paper out of the game. A series indicates the number of unique faces that a single set will contain. For example, a 9,000 SERIES has 9,000 unique faces. An entire evening or daytime program of bingo consisting of regular games usually played on hard cards and special games played on throwaways, flimsies or paper sheets. A session usually lasts between two and three hours. A set refers to the number of unique bingo faces in bingo paper, numbered in sequence and uniform color. Six or nine numbers in a block on one bingo card. Speed bingo is a variation of regular bingo. Numbers are called very quickly, and you can get bingo in as few as three numbers. Speed bingo is usually played before or after a regular session. A one-window pull tab. Also known as Popp-Ettes™ or Tabbies. A term used for jar tickets when 3, 4 or 5 of them are stapled together. The paper, which is cut to specification and is usually sold one color to the case. It may be either loose or padded. (Bonanza™) Single bingo faces that are folded and sealed preventing the face from being seen until it is sold and "torn-open." A tear-open or bonanza game is usually the big $ jackpot game. Refers to the number of sheets/pages that are used to make a bingo book. For example, a 10 UP indicates that the book has ten sheet pages of bingo paper. A two-part NCR (no carbon required) form used by players to pick their numbers for a special bingo game; players retain the top copy, turning in the second copy before the start of the game so that it can be used later for winner verification. Eligibility required winning additional jackpot amounts. Price varies by the number of cards played. A short bingo session (2-4 games) used to get the players warmed up. Small prizes are usually awarded. The wild number is played on a double bingo that leads into a triple bingo. The first number out of the hopper determines the wild number. For example, if N42 is drawn, all numbers ending in 2 should be marked off. A stand-alone bingo game (not part of the regular session) played toward the end of the evening where cards are sold for play and all money raised in their sale will be given back as the prize. View our full catalog of bingo knowledge resources.